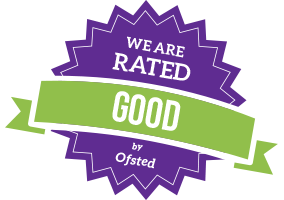 The Nursery facilities are housed over two buildings and offer a variety of rooms allowing for the varying needs of the children. The children are based in five groups according to age. 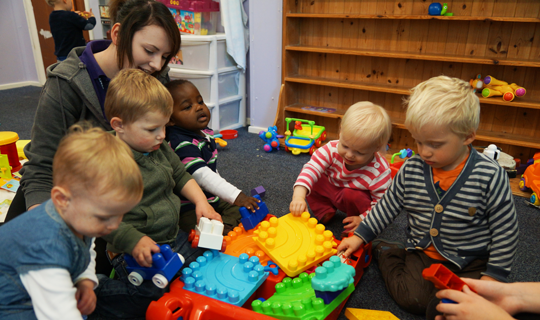 The atmosphere in the nursery is a very relaxed one where children have opportunities to stay in their own base with their key person and also mix with other age groups at various times of the day in the larger open plan areas. This open aspect is popular with parents as their children have the opportunity to mix with different age groups and are therefore familiar with all staff which is essential for continuity of care. This also ensures that transition to groups is a smooth and relaxed one for your child. 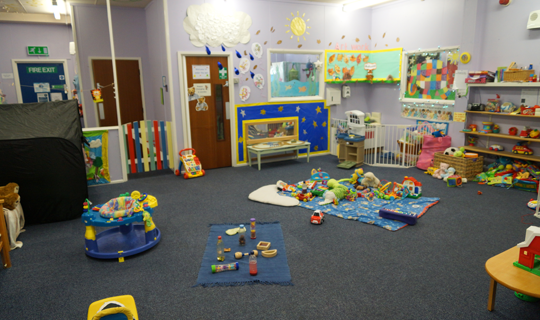 The Baby Room is a large airy room allowing for plenty of space for young babies to play, crawl and learn to toddle. Within this nursery facility are low pieces of furniture to encourage children to pull themselves up and give opportunities for taking their first steps. A variety or resources are available where babies can enjoy various experiences of sight, sound, smell and touch which are all important in a child’s development. A home from home environment is provided where the children’s individual routines and needs are met. There is also a room connecting the Baby Unit to the Toddler room where the babies enjoy mealtimes together. The room is also used during the day for the children to take part in messy play and creative activities. There is also a phone in the baby room so parents can speak to staff directly which can be reassuring for parents leaving their children for the first time. The nursery Toddler Room is light, airy and full of enriching resources to stimulate and assist in your child’s early year’s development. At this age toddlers are encouraged to explore and express themselves. The children’s choices are supported by having a large variety of enriching resources. These are easily accessible in low level units to stimulate and assist in the children’s early years development and independence. Through continuing observations the activities are planned around the children’s likes and interests. As the children continue to develop they move into Red Group. Red Group is a separate room continuing the feeling of being in a secure base with their Key Persons. During their time in this group they often team up with older children in the Open Plan room allowing them the opportunity to access a different type of environment and preparing them for mixing with slightly larger numbers of children. The staff in Red Group continue to plan around the children’s interests by extending the learning opportunities of the wide variety of resources available. There are currently two age groups based in the Open Plan Area: Yellow Group and Pre-School. The large open plan area gives children further opportunities to explore and socialise with all ages and allows for free flow between the groups if your child so wishes. 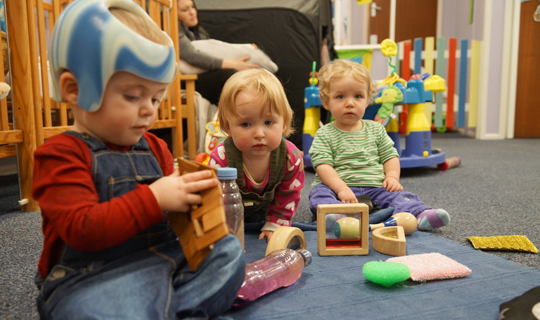 Children in Yellow Group learn through play and are encouraged to make their own decisions. Staff support the children in Yellow Group in both planned and child initiated activities as the children are beginning to prepare for Pre-School. The Pre-School Group provides the children with the opportunity and experiences to further develop their confidence and independence. Pre-School provides a secure environment enabling the children to develop the skills required in preparation for school. The large outdoor nursery play area facility with its safety surface provides a fantastic opportunity for your child to explore, socialise, exercise and take their learning experiences outdoors. 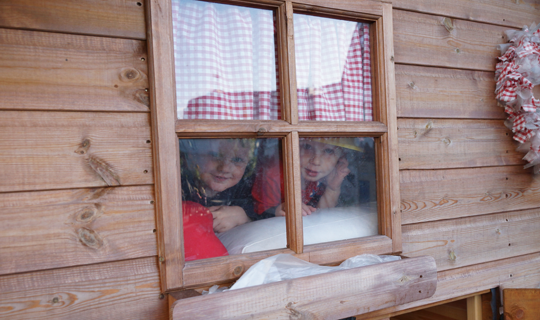 The wooden playhouse with its upstairs cabin captures the imagination of the young children where storytelling and role play take place. The covered shelter also allows activities to be carried out in all weathers. Either side of the playground are a grassed area and a small garden where the children love to help with the gardening, digging, planting, sowing and watering the plants and watching them grow. The fascination of finding bugs under stones and looking at them through a magnifying glass all gives opportunity for continued learning through experiences. The nursery also makes regular use of the 2012 Sports Hall immediately next to the nursery which offers additional space for more challenging exercise. We also visit a range of local facilities including two local parks, the Museum, Library and Leisure Centre Swimming Pool. 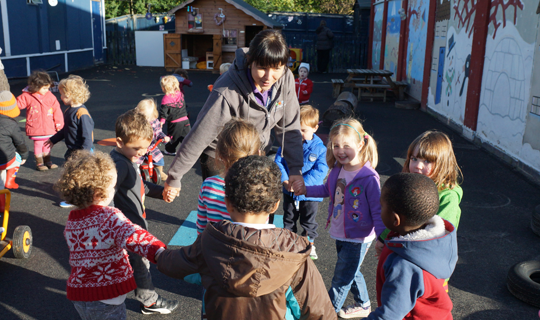 The nursery also makes use of outside organisations to enrich the childrens’ learning. Annual visits from Raptor Rescue and Zoo Lab are very popular allowing the children the opportunity to handle the animals and insects and learn about them. We are always looking to use external organisations to enrich the learning opportunities.